From the north side looking south, showing the new GWR 1928 crossing fitment. South gate closed against WHR - the 1923 station is beyond it, the water tower being clearly seen. Locomotive Publishing Co. photo no. 1663 (which had usually been dated summer 1928) must post-date the relaying of the crossing fitment on 28 October 1928. 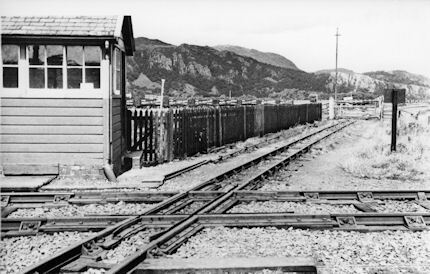 The crossing from the south: the 1928 crossing fitment – in bridge rail and angle-iron style check rails – is clearly shown; note the different type of rails from those in "CambrianCrossingWithBoxLookingNorth" photo. The north gate is closed against the WHR. 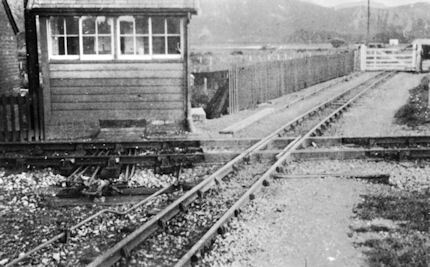 The Pwllheli Granite Co wagons are on the standard gauge Beddgelert Siding. Photo by F C LeManquais, 11 August 1934. 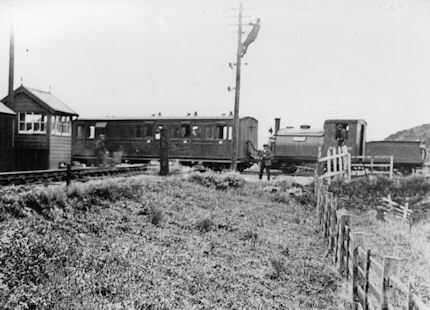 Looking east with an England engine on an Up train about to pull into Portmadoc 1923 station. 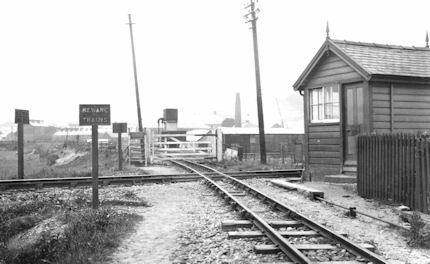 Note the GWR Porter signalman with flag outside his box; the about-to-be removed gong on a wooden post in the south-west angle between the two lines, and a lineman up a telegraph pole. This iconic shot, from the Topical photographic agency, appeared in The Railway Gazette of 26 October 1923.